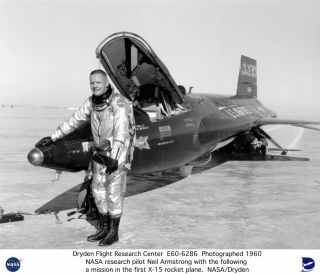 Dryden pilot Neil Armstrong is seen here next to the X-15 ship #1 (56-6670) after a research flight. Astronaut Neil A. Armstrong, Apollo 11 Commander, inside the Lunar Module as it rests on the lunar surface after completion of his historic moonwalk in July 1969. In major respects, Neil chose to leave that particular stage of his life to the history books. It was like the golfer Bobby Jones never playing competitive golf after winning the Grand Slam or Johnny Carson never again appearing on TV after leaving "The Tonight Show." Not that Neil lived the life of a recluse after Apollo 11 — that is a myth created by journalists frustrated with not getting interviews with him. After the moon, Neil lived a very active life with many more accomplishments to his credit — in teaching, in research, in business and industry, in exploration. And he lived it all with honor and integrity, just as the one with "The Real Right Stuff" should. Astronaut Neil A. Armstrong, wearing an Extravehicular Mobility Unit, participates in a simulation of deploying and using lunar tools on the surface of the moon during a training exercise in Building 9 on April 22, 1969. Armstrong is the commander of the Apollo 11 lunar landing mission. In the background is a Lunar Module mock-up.